Since then, Instagram has overtaken Snapchat in both the number of daily users and continuous growth. While the choice between the two may seem clear, there is still a huge market of Gen Z-ers on Snapchat along with additional benefits to advertisers that aren’t offered by Instagram. Follow along to find which platform might be the best to communicate your company’s marketing strategy. As a marketer, what’s the difference between Snapchat and Instagram? Instagram is the world’s largest visual content platform and was recently acquired by Facebook. Meaning it not only seamlessly integrates with Facebook, but your ad buying power can go twice as far by covering ground on two platforms. The content on the stories section of the app lasts 24-hours, just like Snapchat. But extra features allow the option to save the stories for longterm viewing on individual accounts. Additionally, helpful links can be added to stories as a means of bypassing Instagram’s no links policy. Snapchat’s original draw was its privacy. Snaps only lasted up to 10 seconds and were only good for one view and Snapchat stories last for 24 hours. In more recent updates, Snapchat has extended those features to add infinity timers for photos, multiple viewing allowances and more. 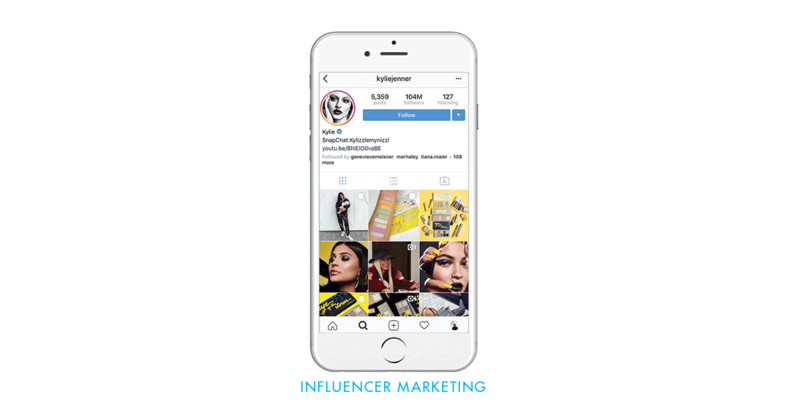 As an advertiser, this platform allows for video space bought between snap stories, and with the latest update, an entire page devoted to strictly business and influencer stories. These benefits create a showcase for those that are paying to advertise on the medium. While both platforms have pros and cons for advertisers, the long-term resources offered by Instagram tilt the scale in their favor. Both Instagram and Snapchat target users under 35. However, Instagrams highest user demographic is 18-24 while Snapchat’s main user hasn’t even graduated high school yet. This drastically changes what products to pedal via each platform. This gives Snapchat the opportunity to create lifelong consumers of products, while Instagram might have more of an uphill battle catering to people with established buying habits. Another key pattern among younger consumers is valuing experiences over things and having a social conscience that influences purchases. Local buying plays directly into both of those buying patterns. Instagram allows for location tagging which makes it easy to see what other people are posting from the same location. 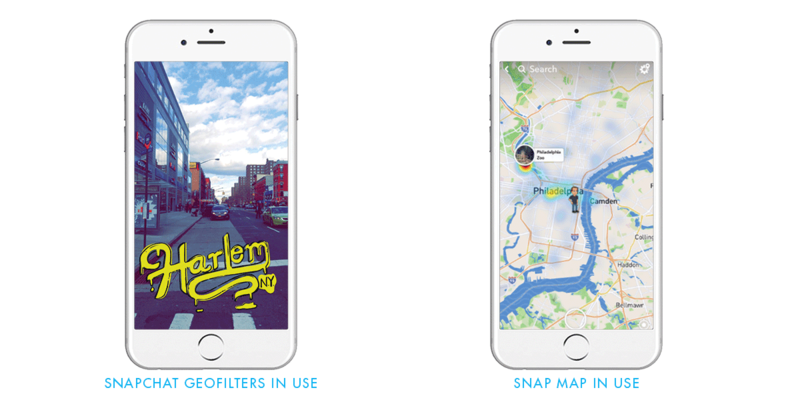 Snapchat, on the other hand, targets users with Snap Map which allows users to see their friends’ precise locations. Geofilters on Snapchat also allow for hyper-specific location marketing for everything from a wedding to a large scale TV show premiere. While Instagram offers a few add in location stickers, nothing that is as elaborate as the often user-created filters on Snap. The niches able to be explored by Snapchat create targeting that is second to none. Among consumers ages 18-35, influencer and micro-influencer marketing is huge. Recommendations from friends and trusted sources mean more than professional endorsements in this age range. Between our two contenders, both have a heavy influencer population. The short-term format makes stories the perfect place for sponsored content (or #sponcon) for on-the-go products and services. But, since the unveiling of Instagram’s stories feature, influencers have posted to their stories on average 7.6 times per day. This compares to just 3.5 stories per day on average on Snapchat. This mass migration and drop in frequency seems to be a continuing trend for the platform battle royale. While Snapchat made a valiant effort, the innovation from Instagram in recent years has pushed it to the forefront of temporary story technology and has made it the winner in our eyes. 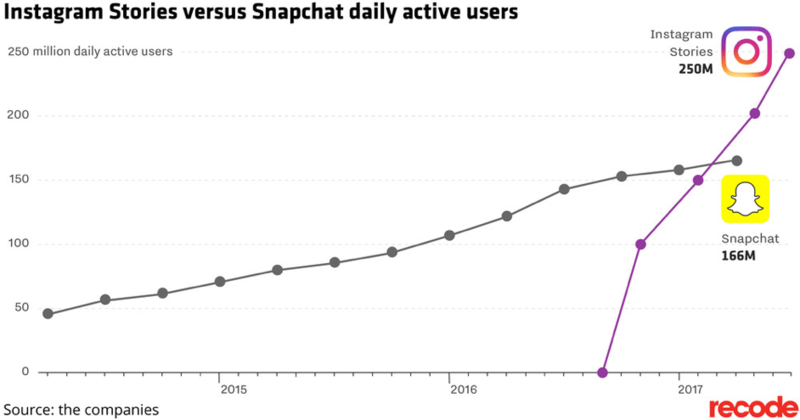 Only time will tell if Snapchat will come out of this slump and once again become a platform of choice among young consumers. Until then, consider switching your company marketing efforts to Instagram for more long-lasting content. For help evaluating all aspects of your social media needs, contact us at Fuzzy Duck to schedule a free no-obligation consultation.